The National Renewable Energy Laboratory (NREL) recently collaborated with the United States Agency for International Development (USAID) and the Lao People's Democratic Republic's (Lao PDR's) Ministry of Energy and Mines to produce the Task 2 Report - A GIS-Based Technical Potential Assessment of Domestic Energy Resources for Electricity Generation. This analysis, a part of the larger Energy Alternatives Study for the Lao People's Democratic Republic, explores how domestic and imported renewable energy resources could be developed to complement Lao PDR's existing energy infrastructure. The Task 2 Report assesses the technical potential of renewable energy and other energy resources and analyzes the cost of electricity generation. The report highlights a broader set of planning priorities, beyond least-cost investment, that include economic, social, and environmental factors. The figure below highlights one of the results from the report: a map of average wind speeds in Lao PDR. The capacity-building workshops, technical consultations, and publications resulting from this year-long study will support the Lao PDR's Ministry of Energy and Mines and other energy stakeholders in their energy sector planning. The five tasks of the Energy Alternatives Study are outlined in the figure below. For more information, read the Task 1 - Assessment of Data Availability to Inform Energy Planning Analyses report, which summarizes the availability and quality of data that serve as key inputs to energy planning activities and informs future investments in energy data collection and management, explore the full Task 2 report, or review a presentation given at the Asia Clean Energy Forum by the Lao Ministry of Energy and Mines. The USAID-NREL Partnership is continuing to collaborate with Ministry of Energy and Mines and other Lao power sector actors through support for a vulnerability assessment and a power sector resilience planning activity. Also visit the USAID Clean Power Asia Program website to learn more about this and related activities in the region. 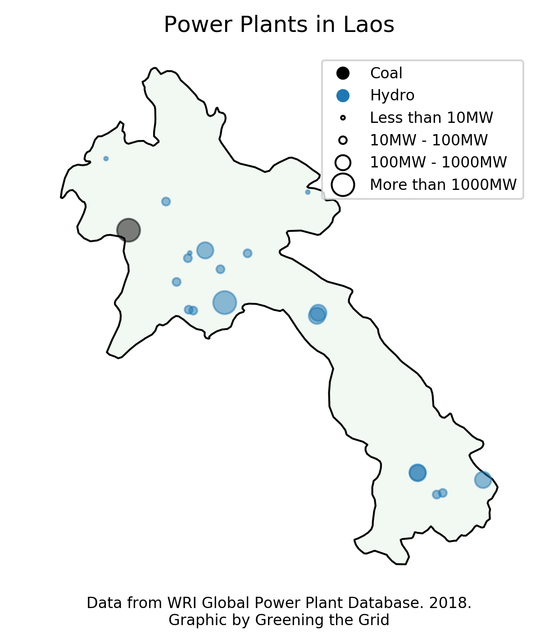 The map below shows the location, type and size of power plants operating in Lao PDR.